Carcinoma of unknown primary (CUP) origin is a heterogeneous group of cancers defined by the presence of histologically proven metastatic disease with no identifiable primary tumor at presentation. Between 5% and 10% of all cancer patients are diagnosed with metastatic lesion of an unknown primary tumor. Complete evaluation should include a detailed clinical history and physical examination including pelvic and rectal examination, complete blood count and biochemistry, urinanalysis and stool occult blood testing, histopathological review of the biopsy material with the use of immunohistochemistry, chest radiography, computed tomography (CT) of the abdomen and pelvis, and in certain cases, mammography. The inability to locate primary tumors prevents undertaking the optimal therapies, which in addition to is dependent on tumor differentiation, tumor location, and tumor stage as determined according to the tumor node metastasis system, thus negatively affecting the patient outcome. CUP constitutes seventh to eighth most frequently occurring cancer in the world and the fourth most common cause of cancer-related death in both men and women., Better patient outcome requires detection of occult primary for appropriate treatment planning. A few studies that have investigated the survival aspect have also highlighted the importance of detection of the occult primary in bettering survival in these groups of patients., One meta-analysis reviewed the diagnostic accuracy of 18F-fluorodeoxyglucose positron emission tomography/CT (FDG-PET/CT) in CUP and reported the detection rate of primary tumor to be 37%. The aim of the present study was to retrospectively evaluate our institutional data for the usefulness of FDG PET/CT in patients with CUP. This was a retrospective, cross-sectional survey of patients with CUP syndrome who were referred for 18F-FDG PET-CT studies during the period of March 2013 to February 2015 and reviewing the patients' records for assessing the results. FDG-PET-CT scans were performed in compliance with the standard whole-body protocol, i.e., at least 6 h of fasting and were carried out with injected FDG radioactivity dose between 259 MBq and 370 MBq. The time from FDG injection to PET data acquisition was between 60 and 90 min. PET/CT scanning was acquired from the skull base to the upper third of the thighs. Non-enhanced, low-dose attenuation correction CT (110/70 kV/mAs) was performed for all patients. The scans were undertaken in a time-of-flight PET-CT scanner (Gemini TF PET/CT, Philips Medical Systems, USA). Twenty patients clinically designated with CUP syndrome fulfilling the inclusion criteria were included in this analysis, which comprised 14 females and 7 males (mean age of 57.95 years; age range 42–70 years). The patients were subdivided into two groups: A - Those with histopathological proof of metastatic disease with unknown primary tumor – 12 in number. B - Those with clinical/tumor markers/radiological suspicion of malignancy (where biopsy was not possible) along with symptomatology of profound weight loss and/or progressive weakness – 9 in number. Visual assessment was done by evaluating the attenuation corrected and uncorrected PET images with anatomical localization of the hypermetabolic foci using the corresponding CT images. The patient's history, distribution, and pattern of spread of different tumors were taken into consideration. Among the twenty patients were examined using PET/CT, 14 (65%) patients were females and 7 (35%) were males. The mean age of the study group was 57.95 years, with a range of 42–70 years. Out of the 21 enrolled patients, 12 had histopathologically proven metastatic disease with an unknown primary tumor. The lymph nodes were the most frequent site of metastasis, observed in 9 of 20 patients (75%). This was followed by brain (n = 2 or 16.67%) and liver metastases (n = 1 or 8.33%). 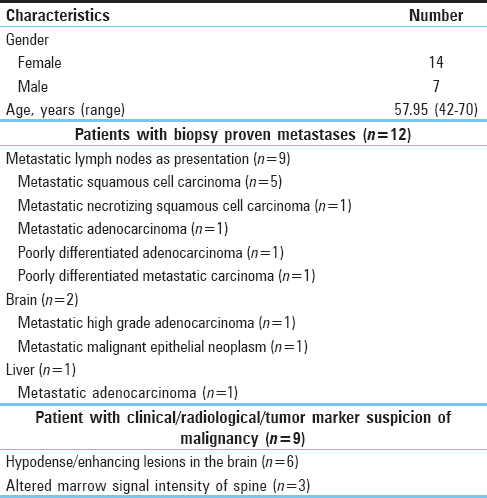 The details of metastatic site and histopathologic tumor types are listed in [Table 1]. Six out of nine patients (66.7%) presented with clinical and radiological suspicion of malignancy had hypodense/enhancing lesions in the brain and three out of nine (33.3%) had altered marrow signal intensity of spine [Table 1]. Overall, hypermetabolic lesions indicating the primary tumor sites were identified in 14 patients (66.7%). Twelve out of these 14 primary sites were subsequently proven by histopathology [Figure 1]. Two patients with biopsy-proven metastatic lesions in brain, with suspicious primary site in lung had shown intense uptake in the putative site of primary by FDG-PET/CT and also multiple other metastatic sites, were not biopsied and were subsequently enrolled for palliative chemotherapy. No primary site could be identified in seven (33.3%) patients [Figure 2], in which scans were either positive only for known metastatic site with no identification of primary site [Group A] or with either unremarkable PET-CT scans without any abnormal hypermetabolic site [Group B]. The identified primary tumor sites were lung 9/14 (64.4%), uterus/cervix 2/14 (14.3%), breast 1/14 (7.1%), esophagus 1/14 (7.1%), and aryepiglottic fold 1/14 (7.1%). When the results were examined individually in each of the Group A and Group B, the primary tumor detection rate was 58.3% and 77.7%, respectively. The incidence of CUP is strongly related to age, with the highest incidence rate in older men and women., Similar statistical data were found in our sample (mean age of 57.95 years), with the majority were in the age group of 50–70 years. In our study, primary tumor detection rate was noted in 66.7% of cases and this was in keeping with the studies in the literature that reported rates between 22% and 73%., FDG PET-CT could not localize primary tumor site in 33.3% of patients. In addition to the primary tumor detection in patients with CUP, FDG-PET/CT enables accurate whole body disease staging allowing appropriate treatment planning and thus improving patient prognosis. In addition to detection of the primary, the clinical impact of FDG PET-CT in the evaluation of patients with CUP could also be envisaged in the disease management either through detection of more secondaries or evaluating a critical lesion which requires urgent intervention (additional characterization such as lesion compressing the vertebral column or critical bone lesion which can be included in the targeted radiation field) and provide immediate symptomatic relief. Furthermore, CUP may represent a separate group of cancers with genetic and phenotypic characteristics with unique clinical presentation, in which the primary focus should be identification of treatable cause.,, Despite a number of studies have documented high sensitivity and specificity of PET/CT in CUP, there remains some shortcomings of this modality. One of them being false positive finding and the other false negative study, both of which remains as a subject of concern with PET/CT. FDG PET/CT is a useful diagnostic technique in the evaluation of patients with CUP. Further improvement in PET/CT scanner resolution, image analysis algorithm, and other parametric data could further increase the sensitivity. Being a whole-body technique, it can additionally aid in disease staging in these patients which is potentially helpful in their clinical management. van de Wouw AJ, Janssen-Heijnen ML, Coebergh JW, Hillen HF. Epidemiology of unknown primary tumours; incidence and population-based survival of 1285 patients in Southeast Netherlands, 1984-1992. Eur J Cancer 2002;38:409-13. Pavlidis N, Fizazi K. Carcinoma of unknown primary (CUP). Crit Rev Oncol Hematol 2009;69:271-8. Greene L. AJCC Cancer Staging Manual. New York: Springer; 2002. 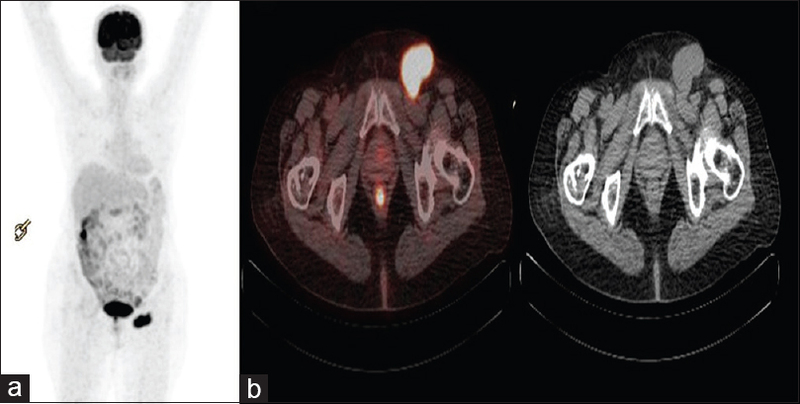 Kwee TC, Basu S, Cheng G, Alavi A. FDG PET/CT in carcinoma of unknown primary. Eur J Nucl Med Mol Imaging 2010;37:635-44. Haas I, Hoffmann TK, Engers R, Ganzer U. Diagnostic strategies in cervical carcinoma of an unknown primary (CUP). Eur Arch Otorhinolaryngol 2002;259:325-33. Raber MN, Faintuch J, Abbruzzese JL, Sumrall C, Frost P. Continuous infusion 5-fluorouracil, etoposide and cisdiamminedichloroplatinum in patients with metastatic carcinoma of unknown primary origin. Ann Oncol 1991;2:519-20. Kwee TC, Kwee RM. Combined FDG-PET/CT for the detection of unknown primary tumors: Systematic review and meta-analysis. Eur Radiol 2009;19:731-44. Pawaskar AS, Basu S. Role of 2-fluoro-2-deoxyglucose PET/Computed tomography in carcinoma of unknown primary. PET Clin 2015;10:297-310. Pentheroudakis G, Briasoulis E, Pavlidis N. Cancer of unknown primary site: Missing primary or missing biology? Oncologist 2007;12:418-25.
van de Wouw AJ, Jansen RL, Speel EJ, Hillen HF. The unknown biology of the unknown primary tumour: A literature review. Ann Oncol 2003;14:191-6. Dong MJ, Zhao K, Lin XT, Zhao J, Ruan LX, Liu ZF, et al. Role of fluorodeoxyglucose-PET versus fluorodeoxyglucose-PET/computed tomography in detection of unknown primary tumor: A meta-analysis of the literature. Nucl Med Commun 2008;29:791-802. Sève P, Billotey C, Broussolle C, Dumontet C, Mackey JR. The role of 2-deoxy-2-[F-18]fluoro-D-glucose positron emission tomography in disseminated carcinoma of unknown primary site. Cancer 2007;109:292-9. Rusthoven KE, Koshy M, Paulino AC. 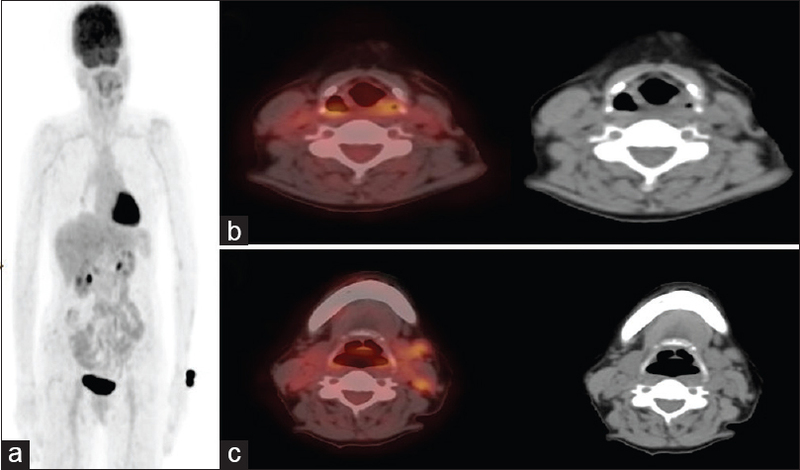 The role of fluorodeoxyglucose positron emission tomography in cervical lymph node metastases from an unknown primary tumor. Cancer 2004;101:2641-9. Delgado-Bolton RC, Fernández-Pérez C, González-Maté A, Carreras JL. Meta-analysis of the performance of 18F-FDG PET in primary tumor detection in unknown primary tumors. J Nucl Med 2003;44:1301-14. Riaz S, Nawaz MK, Faruqui ZS, Saeed Kazmi SA, Loya A, Bashir H, et al. Diagnostic accuracy of 18F-fluorodeoxyglucose positron emission tomography-computed tomography in the evaluation of carcinoma of unknown primary. Mol Imaging Radionucl Ther 2016;25:11-8. Hemminiki K, Liu H, Hemminiki A, Sundquist J. Power and limits of modern cancer diagnostics: Cancer of unknown primary. Ann Oncol 2012;23:760-4. Wang G, Wu Y, Zhang W, Li J, Wu P, Xie C, et al. Clinical value of whole-body F-18 fluorodeoxyglucose positron emission tomography/computed tomography in patients with carcinoma of unknown primary. J Med Imaging Radiat Oncol 2013;57:65-71. National Institute for Health and Clinical Excellence. Diagnosis and Management of Metastatic Malignant Disease of Unknown Primary Origin (Clinical Guideline 104). London: National Institute for Health and Clinical Excellence; 2010.